A Southwest Airlines plane sits on the runway at the Philadelphia International Airport after it made an emergency landing in Philadelphia, on Tuesday, April 17, 2018. 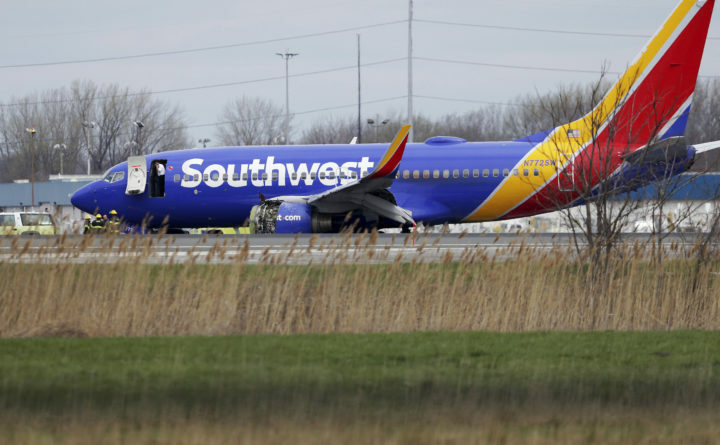 A Southwest Airlines flight from New York’s Laguardia Airport to Dallas made an emergency landing at Philadelphia’s airport Tuesday with part of the covering from its left engine ripped off. Passengers walked off the plane on the tarmac at the airport. It wasn’t immediately known if anyone on board was injured. The Philadelphia airport tweeted that flight 1380 “landed safely at PHL and passengers are being brought into the terminal.” No other details were given. Messages seeking comment from the Federal Aviation Administration wasn’t immediately returned.